Next up: Boxing up the kitchen. And figuring out where to put those boxes. It almost makes me want to make a prom dress out of rubber spatulas and Brillo pads. Meet my kitchen, as it is today. These photographs are not for the fainthearted. I actually started to clean and straighten up the kitchen before taking these photos. Who am I trying to impress? Anyone who's been here has seen the kitchen in all its cluttered glory before, and anyone who hasn't will be disgusted enough by the layout to overlook the detritus of our lives that accumulates in here. This is the sink area. 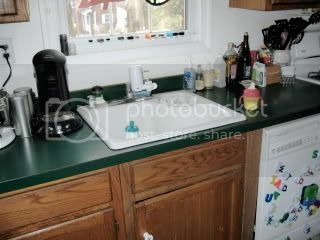 Love the kelly-green Formica! The warped oak cabinetry! The entirety of my workable counter space! The white porcelain sink may look charming at first glance, but note that the disposal is in the tiny little elevated section in the upper right. Does this make sense to you? It means you have to either work over the tiny section, or else gather up handfuls of waste and transfer it to the tiny section. I long since gave up on having canisters on the countertops; I actually sacrificed all other appliances when I got the KitchenAid mixer, then broke my own rule when I got the Senseo coffee machine. These two items further reduce my usable counter space problem but I can't do without either of them. The result is that I don't roll out dough. Ever. Sometimes I really complicate things (and compromise our already-faulty electrical works) by adding the crock pot to this fun mix. Our refrigerator. The doors can only be opened at 90-degree angles, thanks to placement by the doorway there. It's all right except when you want to remove trays for cleaning, or fill the ice trays. Like the microwave on top of the refrigerator? I put it up there a couple of years ago because it had been taking up half of my counter space (where the mixer and coffeemaker are now). Only people 5'9" and above can use our microwave, and I don't recommend anyone under 5'11" using it for drinks for fear of McDonaldsesque hot-beverage lawsuits. My dry-erase calendar and the school lunch menu are crammed in the only place they're easily seen. The cabinet behind the microwave was useless even before I moved the microwave there. I have no idea what's there at the moment, and I'm deathly afraid it's a colony of mice. The gas range. Yes, it's directly next to our doorway. It's a side door that serves as the main entrance to the house; yes, I realize how strange that is and I could go on and on about that but won't here; that kind of renovation just isn't ever happening. If it's a nice spring day and I want fresh air, I can't use the range. If I'm using the range and someone needs to come in from outside, there's a collision and conflict of interest. We put up the shelf over the range a few years ago so I'd have a spot for my cookbooks, knives, the breadbox, and my oven mitts. You know you've got a problem when you have nowhere for your oven mitts. View from refrigerator to the door. Yes, folks, this is the whole kitchen. I'm lucky I was able to stand back far enough into the hall to get this shot. 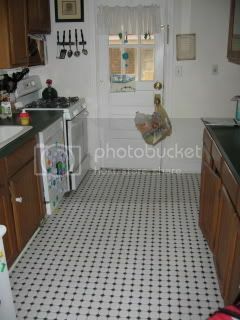 At first glance the ceramic floor looks kind of cool, doesn't it? You would quickly change your mind once you realize it crunches under your feet (subflooring wasn't installed properly), and the grout is permanently stained dirt-brown. I'm embarrassed to admit that I thought the grout was supposed to be brown for the first seven years we lived here. After experimenting with a Mr. Clean Magic Eraser I learned otherwise, and I actually became obsessed with cleaning the grout and spent the better part of a week last year with a steel brush and a giant canister of Comet. The difference was astonishing once it was all done ... but since this area also serves as our entryway, you can just guess how long the clean grout lasted. The grocery bag on the doorknob is my clever solution to where to put the recyclables. Since I don't have room for a bin, and I don't want a bin outside near the door because of the neighborhood rodents, I just fill a bag every few days then carry it out to the bin near the street. I'm considering patenting this sytem. My clever solution to the backpack/purse/coat problem. Yes, I've had to use all my genius to make this kitchen work for the past 8 years; I like to think of it as life handing me lemons and me making some really bad lemonade out of it. 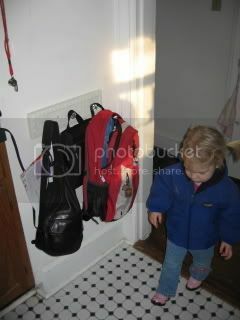 Bags and kid coats are generally kept to this area, but they overflow to hooks on the basement and bathroom doors. Springtime in Washington further confuses my outerware storage problem since temperatures can fluctuate 50 degrees within 24 hours. View from the kitchen to the dining room. See my clutter? See the Clorox Wipes I'd brought out to clean before this photo shoot? I actually stopped cleaning because we suspect A.J. is sensitive to the chemicals in them. Great, just what this house needs -- more reasons for me not to clean. 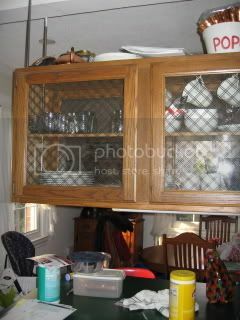 Those are suspended cabinets that were probably designed to create an attractive division between the kitchen and the dining area. What they really do is create a division, period. They render the countertop beneath useless since they hang low (even when the counter is free of mail, school papers, keys, and Clorox wipes). The top shelf does come in handy for confiscating the GameBoy, because no kid -- no matter how determined -- would risk trying to get up there. View from the dining room to the kitchen. Eerily similar to the view from the kitchen to the dining room, isn't it? The lower right corner is what I've essentially set up as a homework station for A.J. (When the tub of Trader Joe's cookies and plastic hammer aren't there. Well, actually, sometimes when they are there.) A.J. likes being around all of us, even if that means squeezing into the few free square inches on the counter. 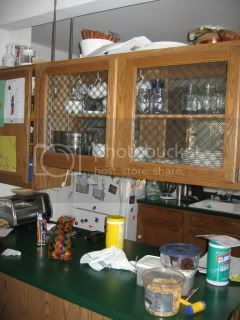 He likes to eat here, too, and I spend a lot of time talking to his chin since the cabinets hide the top of his head. How many problems did you see with all of these pictures? Stay tuned for dining room pictures. Just got a letter from the credit union in the mail. I tore it open, thinking it was more paperwork. It wasn't -- it was a live check for the full amount of our loan. An amount larger than any of my yearly salaries had ever been. Now I'm afraid to touch it. Never having floated a loan like this before, I don't know quite what I had expected. A set of dedicated checks? A credit card? Certainly not the biggest check I've ever seen in my life. The challenge will be not to spend it all in one place ... say, Sephora. Or start thinking I'm rich just because my bank balance says so. We also have a fairly firm start date: April 4. Our salesman said the team wanted to make sure it finished its current job before starting ours. I said if they could start the week before I'd be able to clear out the kitchen with a night's notice. Part of me is afraid to have my house taken over in this fashion, but a bigger part of me wants the cruddy old kitchen (and all the mice living therein) demolished sooner than later. We bought this house in 1998 after almost a year of looking all over Northern Virginia for what we planned would be our long-term address. Since our old condo is a mere two miles from here, it turned out that we, like Dorothy, hadn't needed to look any farther than our own backyard. Liveable condition since we are not do-it-yourselfers by any stretch of the imagination; we figured we would make improvements over time but in the meantime had to be fairly comfortable. Those three conditions, simple as they are, were hard to find in our price range -- especially since we were determined not to push ourselves financially and become house-poor. It seemed they were most prevalent in home styles that I didn't much like: ramblers (I hate the thought of a hole in the floor leading to the basement, and the bedroom being right next to living areas) and split-foyers (clearly designed by some '60s architect under the influence of something psychedelic: "Kitchen upstairs half a flight! Living room downstairs half a flight! Heavy."). NoVa is lousy with brick Colonials -- the 1930s version of cookie-cutter McMansions here in what used to be the far-out suburbs -- but we couldn't seem to afford any in decent condition. When we found this house, my legs started to shake soon upon entering it. Not because it was perfect -- far from it. It fronts to a very busy road; it had awful wallpaper and paint throughout; it was filthy from years of being a rental. But something about it spoke to me. Why? I just don't know. I read recently that houses appeal to people chiefly because they look for something that brings them back to childhood. Outside of being an older home, this house doesn't resemble where I grew up at all. Looking back, I think I was falling in love with the class hoodlum. There seemed to be a lot of potential; it has good bones. I liked how a lot of the house seemed true to the period, and I especially liked how our three non-negotiables were contained in a Colonial house when I had lost hope that we'd be in anything but a rambler (and I'd live in eternal dread of falling down the basement stairs). What really confused me about falling for this house is that it didn't meet my one wish-list item. You see, John and I both had wish lists of "nice to have" features. His was a large, level yard for ball-playing; mine was a good-sized kitchen. 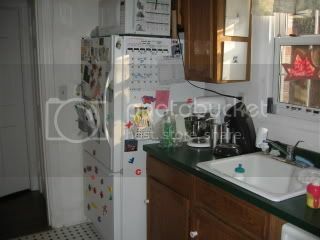 We got the yard, but the kitchen ... oy vey. More about that later. But love makes you do crazy things. We bought the house, warts and all. We settled in, made a few small- and medium-sized repairs, and nine months later, our first child was born. We brought him home -- in the middle of July's biggest heat wave -- to a house whose much-ballyhooed central air had done busted while we were in the hospital. Good times. Over the years, we've made a few cosmetic improvements. We've replaced that danged air-conditioning system twice (the second time two weeks out of warranty, of course). We maxed-out desired occupancy by bringing home a second baby five years after the first (at least she's small for now). We've lived here happily and mostly comfortably -- even on the one income we've had since the birth of our first child. We shake our heads at the huge infill houses going up in the neighborhood and the expensive additions sucking acquaintances dry. We commisserate with neighbors about the benefits of smaller houses as well as swap stories about mouse infestations and old pipes. So why would we choose to disrupt our mousy-but-decently-copacetic lives with a kitchen renovation? 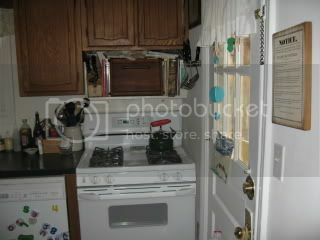 There's no excuse for the kitchen, but here's the deal about this blog. As our kitchen renovation project is scheduled to begin at the end of the month, I thought it would be a good exercise in reporting and patience to keep an online record of it for posterity. I'm a fan of renovation blogs Brownstoner and Our Victorian House; while our kitchen project isn't anywhere close to the scale of those homes' (and I have little more to do with the work than ensuring that the home-equity loan has been secured) I love following the progress, from conceptualization to demolition to nitpicking. Since my kitchen will be out of commission for five to six weeks, I won't be able to indulge in my favorite stress-buster of baking. Therefore, I intend to post updates on the construction, as well as a bit of history about the house. So welcome -- and please don't mind the mess.